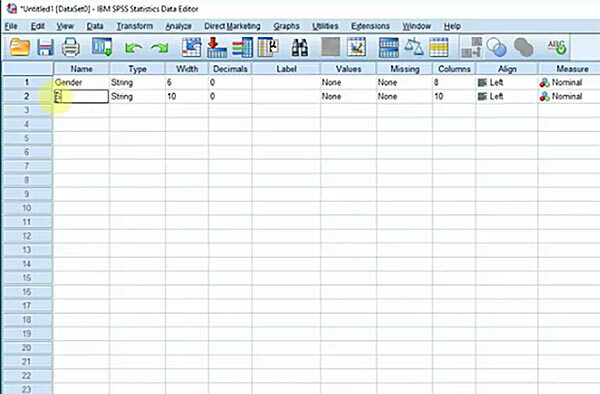 The aim of this tutorial is to provide a very basic introduction to the SPSS statistics package. We will introduce the interface, show how to input some data, generate a simple crosstabs table and build a bar chart. 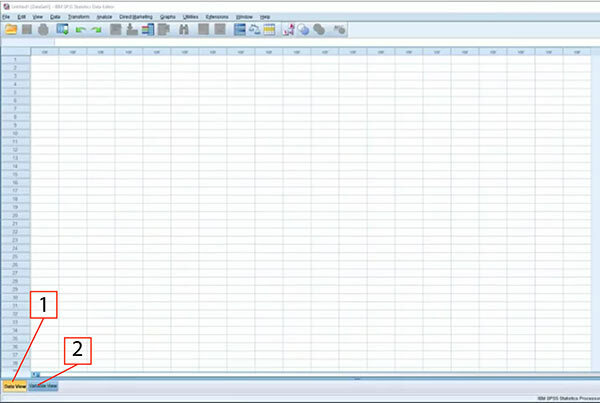 When you first start up SPSS, the data editor window will be displayed by default. The data editor features two tabs, Data View (1) and Variable View (2). The active tab is highlighted in yellow. To add data, you need to select the Data View tab. In the Data View, columns are labelled "Var" and rows are labelled with a number. Columns represent the variables in a dataset and rows represent the specific cases in a dataset (e.g., participants in a study). For our tutorial video, we recorded the gender of our subjects (Column 1) and whether they were a smoker or non-smoker (Column 2). There were 12 subjects in our study, so rows 1 through 12 were populated (see screenshot below). You will notice that in the screenshot above, Column 1 is labelled "Gender" and Column 2 "VAR00002". 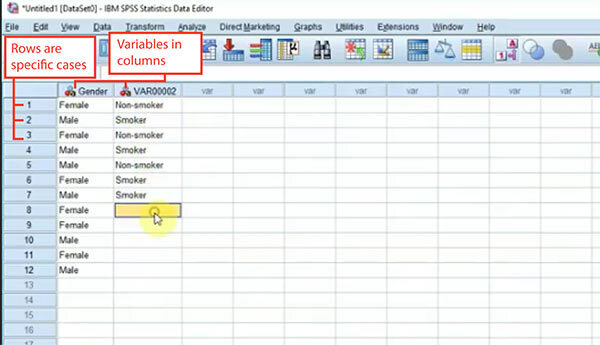 When you first enter data, SPSS automatically labels columns with VAR and a number. To change the label to a meaningful variable name (e.g., gender, age, etc), click the Variable View tab at the bottom of the screen, and then type the new name over the corresponding "VarXXXXX" in the Name column (as below).